Foundation hosts KC Centurions visit | Command and General Staff College Foundation, Inc.
On Jan. 11, the CGSC Foundation hosted a group of emerging leaders from the “Centurions” program of the Kansas City Chamber of Commerce, on a walk and talk tour. 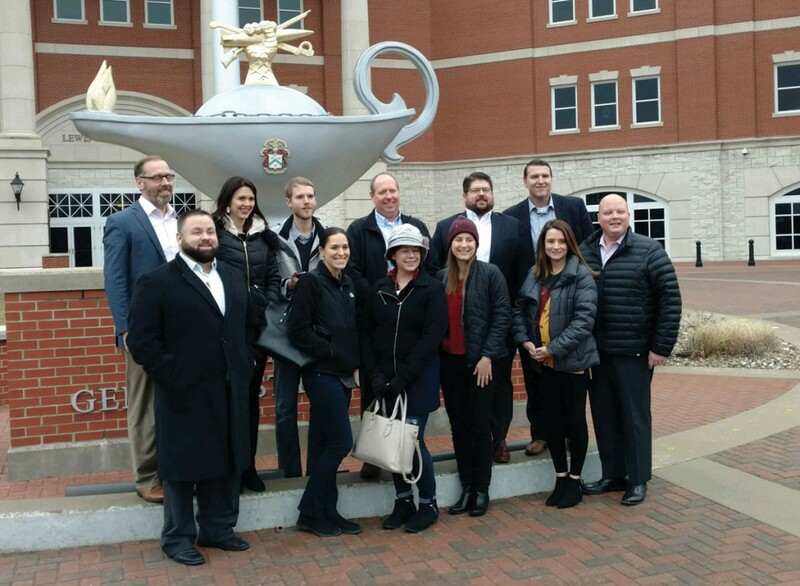 KC Centurions gather outside the Lewis and Clark Center by the iconic Leavenworth Lamp for a group photo during their tour Jan. 11, 2019. Foundation President/CEO Rod Cox first led the 12-member group on a short tour of Fort Leavenworth where he made stops at the Buffalo Soldier and Berlin Wall monuments to discuss the background and history of their presence on the fort. He also took them past some of Fort Leavenworth’s historic brick homes, including the “Rookery,” which was formerly the home of General MacArthur and his mom Pinky, and which also holds the distinction of being the oldest continually habited home in Kansas. They also had the opportunity to see the National Cemetery and learn about some of the famous Soldiers buried there. The group also saw the historic main parade field, as well as the original camp area for Colonel Leavenworth who established the fort in 1827. The next stop for the group was the Lewis and Clark Center, home of the Command and General Staff College, where Cox showed them the Hall of Fame displays in the atrium before escorting them down to the simulations lab, which was the highlight of their visit. Deputy Chief of Simulations Dr. James Sterrett and Battle Simulations Specialist Mike Dunn led the group through a simulations exercise, while also explaining the simulations and gaming instruction used as part of the College curriculum. After the simulations lab Cox took the group to the Frontier Conference Center for lunch, where CGSC Foundation Vice Chairman Lt. Gen. (Ret.) Richard Keller led a discussion about leadership and the life of officers in the Army, drawing parallels with leadership outside of the military. The KC Chamber’s Centurions program is a two-year leadership development program, which prepares greater Kansas City’s emerging leaders for roles of greater responsibility with their companies as well as in the community. Their motto is “Learn. Serve. Lead.” For more information visit www.centurions.org. 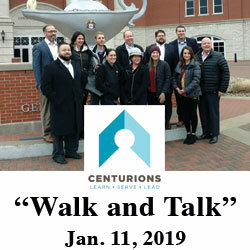 The Centurion’s tour of Fort Leavenworth and the College was one of several visits by businesses and other organizations around the Kansas City region over the past several years as part of the CGSC Foundation’s “Walk and Talk” program. The Foundation runs this program in order to raise awareness about College’s mission of educating leaders for the nation, as well as the Foundation’s role in support of that mission. Contact Joan Cabell, the CGSC Foundation director of development, to learn more. – joan@cgscf.org. Thank you so much for hosting us, it was a powerful experience. You’re doing very important work, and we are thankful for all of you!